If the sloes haven't been exposed to frost before you pick them, put them in the freezer overnight. 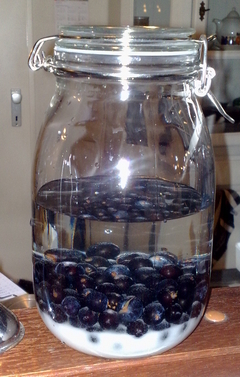 Then place the sloes and sugar in a jar that can be sealed, a parfeit jar is ideal, then pour on the Gin. Close the lid and leave for approx 3 months, giving a shake every few days. "The gin should turn a sumptuous shade of pinkish-purple. A cinnamon stick will add extra flavour, if desired, and some suggest the inclusion of cloves, but they can become overpowering. Straing the gin before bottling it. Serve in a shot glass." Decided that I couldn't wait any longer and it was time to bottle the sloe gin. In the jar it has been sat in for the last 3 months the Gin looked a deep dark purple colour. Strained off the Sloe Berries into smaller bottles it has taken a much subtler hue and now looks like a very beautiful distilled essence of pink, which looks very nice next to the bottle of distilled escence of pure black (pontak sauce) that I made earlier in the year. In total I got just shy of 1L of of Sloe Gin. I haven't tried it yet tho, going to save it till yule to try it then. Smells nice tho. The jar has been sat in the pantry now for 8 days with regular shaking. What started as a clear liquid with a sediment of sugar and some sloes, has turned into a deep purple liquid with most of the sugar desolved and a few the sloes bouncing about when shook. This has to be the simplest bucket chemistry experiment of them all. Stick it all in a jar and away you go. It is now sat there on the side for the next few months, with anyluck I can have some in time for yule. This page last modified Wednesday, 16-Dec-2009 00:37:30 CET.